Posted in Resources (Getting Published, More Publishing Options). An initiative developed by pillar of Irish publishing Dermot Bolger and a man who has an eye for discovering great new writers, Ciaran Carty, with valuable assistance from the Arts Coucil, this bi-annual free magazine features recent winners of the annual Hennessy Literary Awards as well as some of Ireland’s biggest literary names. The New Irish Writing competition that inspires it is sponsored by Hennessy – Richard Hennessy was one of the Wild Geese who fled Ireland to join the army King Louis XV, who settled in Cognac and developed the brandy that bears his name – and appears on the last Saturday of each month in the Review section of the Irish Independent. The competition has been the launch pad for some of Ireland’s greatest writers like Joseph O’Connor, recent recipient of the Irish PEN Award and whose adaption of My Cousin Rachel is currently a massive hit at The Gate Theatre. 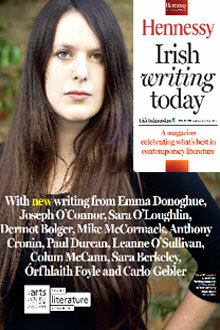 In this edition, writers Sara O’Loughlin (whose stunning picture features on the cover), Sara Berkeley, Angela Finn, Sinead O’Loughlin, Leanne O’Sulllivan, Orfhlaith Foyle and Mike McCormack share the limelight with the Paul Durcan, Emma Donoghue and the fabulous Carlo Gebler whose ‘Notes from a Working Novelist’ is a must read. Colum McCann, Anthony Cronin, Anthony Glavin all contribute, and we get an exciting insight into Joseph O’Connor’s work in progress, Cian and Catherine. As the Irish Independent explains, “The New Irish Writing Page has flourished since its move to the Irish Independent … with first-time writer Pat O’Connor following up his debut on the page in May  by winning the Frank O’Connor International Prize for a single short story with The Haggard. Chosen from an entry of 750 stories from throughout the world, the judges declared O’Connor the “clear winner by a country kilometre.” The prize for best collection of short stories was won by Edna O’Brien. At the same ceremony, John Boyne has been inducted into the Hennessy Literary Awards hall of fame, his thoughts: “I am joining the ranks of some of the greatest Irish writers of our time, authors who have meant a great deal to me over the course of my own life,” John’s ten novels include the best selling The Boy In The Striped Pyjamas, and The Absolutist, out in paperback with Black Swan now. Past inductees of the Hall of Fame include Sebastian Barry, Dermot Bolger, Frank McGuinness, Anne Enright, Hugo Hamilton and Neil Jordan. This magazine marks a turning point in Irish writing, bringing the short story to a wider readership, While the short story is a form that is hugely popular in the United States, it has been known to struggle in Ireland, despite our tradition of story telling. With new reading devices, in our modern fast paced environment, where time is at a premium and the sound byte rules, the short story, a literary byte, is set to make a comeback that will undoubtedly see Irish writer’s dominating the world literary scene. The New Writing Page, edited by Ciaran Carty, appears in the Weekend Review in the Irish Independent on the last Saturday of each month, and is open to writers who are Irish or who are resident in Ireland. Entries may be submitted (with a SAE) to: New Irish Writing, The Irish Independent, 27/32 Talbot Street, Dublin 1. Submit up to six poems. Stories should not exceed 2,200 words. Remember to include your name, e-mail address and phone number. Writers whose work appears in the page will be put forward for the Hennessy New Irish Writing Award. Each category winner will receive a trophy and €1,500, while the New Writer of the Year receives an additional €2,500.